Butterflies in your stomach – you know the feeling. That flutter sensation that creeps up before a big work presentation or meeting someone on a blind date. But have you ever felt butterflies in your chest? Or like your heart is still running the marathon you’ve already finished? We asked Andrea Robinson, MSN, ACNP, an electrophysiology nurse practitioner at OhioHealth Heart & Vascular Physicians, what these feelings mean and when you should call your doctor. Many people experience unexpected heart sensations. While an irregular heartbeat is certainly out of your ordinary and can be alarming, it doesn’t always mean that you need to worry. Atrial fibrillation (AFib or AF) occurs when the electrical impulses in your heart aren’t working the way they’re supposed to. A healthy heart beats 60-100 times per minute, but atrial fibrillation causes it to beat faster, sometimes up to 175 times per minute. This causes the heart to pump less efficiently, which can lead to a lack of oxygen in the body and symptoms like shortness of breath, fatigue or lightheadedness. Robinson says some patients may even have no symptoms at all. As for what causes it, Robinson says you may be at a higher risk for atrial fibrillation if you have had prior heart valve problems, heart attack or heart surgery, or have hypertension, diabetes mellitus, obstructive sleep apnea, thyroid disorders, lung problems, are overweight or consume a lot of alcohol. Your doctor will probably first review your medical history and perform a physical exam to determine what, if any, risk factors you have. They may also order a heart ultrasound, called an echocardiogram, to evaluate your heart valves and heart structure. “An echocardiogram gives us an idea of how well your heart is pumping, measures the chambers of the heart, and can also be used to help assess your risk for a stroke,” says Robinson. Robinson recommends that you know your risk factors for an atrial fibrillation related stroke and discuss with your healthcare provider using the CHA2DS2-VASc calculator to determine your stroke risk and whether or not blood thinning medication may be appropriate for reducing your risk. 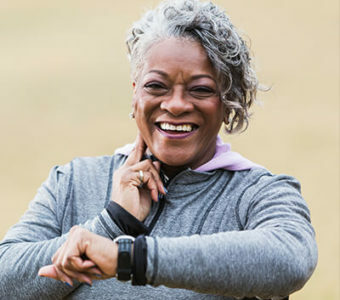 Other methods to test your heart’s rhythm include wearing a Holter monitor to measure your heart’s activity over 24 hours, or an event monitor that allows you to record what is happening when you feel heart palpitations or other symptoms over time. 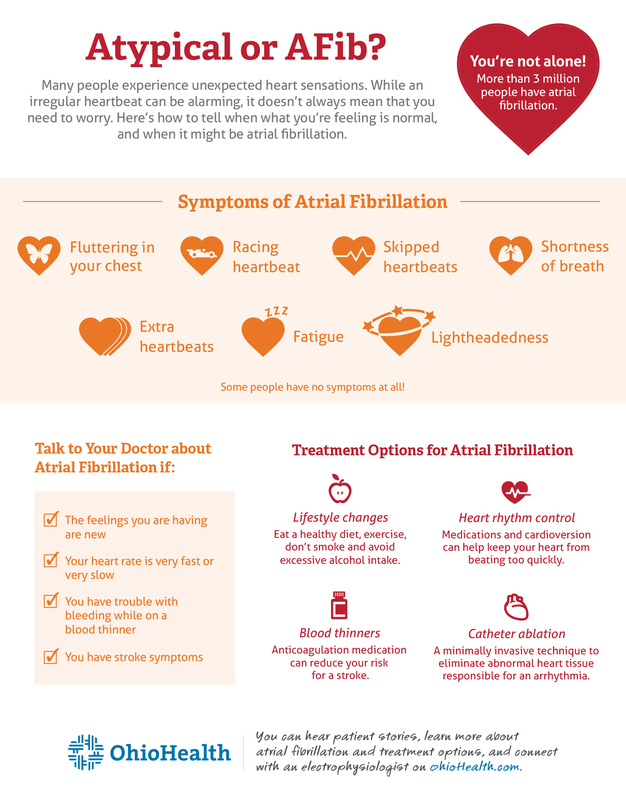 Atrial fibrillation is a chronic condition that is not necessarily curable but can be treated with medications to control your heart rate, blood thinners to reduce the risk of stroke, catheter ablation procedures, surgical procedures and implantable devices. The most effective treatment available is catheter ablation, a minimally invasive technique used to eliminate the abnormal heart tissue responsible for an arrhythmia, says Robinson. Cardioversion, which uses a low-voltage shock applied to your chest to restore a normal rhythm, is another option, though often with temporary results. If your heart is beating irregularly and you are concerned that you may have atrial fibrillation or another cardiac arrhythmia, know that you are not the only one. Many people experience these symptoms and about 3 million people have atrial fibrillation. OhioHealth’s electrophysiology team is ready to help if you need it too. The team includes experts in minimally invasive procedures, and participates in numerous clinical trials, offering patients access to the latest treatments for atrial fibrillation. 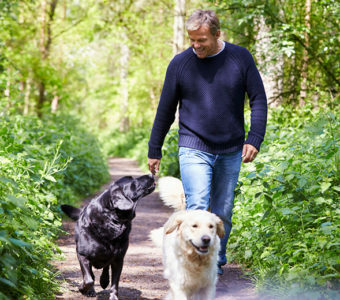 You can hear patient stories, learn more about atrial fibrillation and treatment options, and connect with an electrophysiologist on OhioHealth.com.